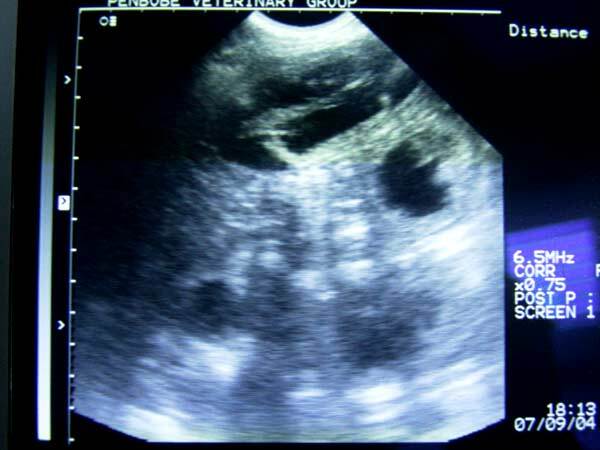 For those of you not used to ultrasound scans, the very white area at the top of the scan is the skin on the abdomen. the probe is placed on the midline of the abdomen, looking towards the spine. 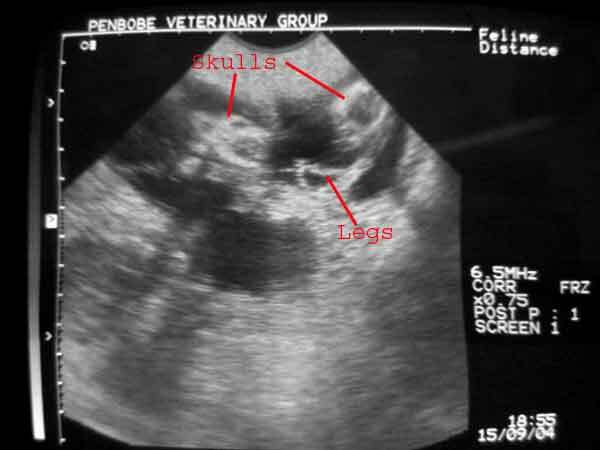 The scan is effectively a cross-section of Jasmine's tummy, with fluid-filled structures (ie the fluid around the puppies) showing up as black. 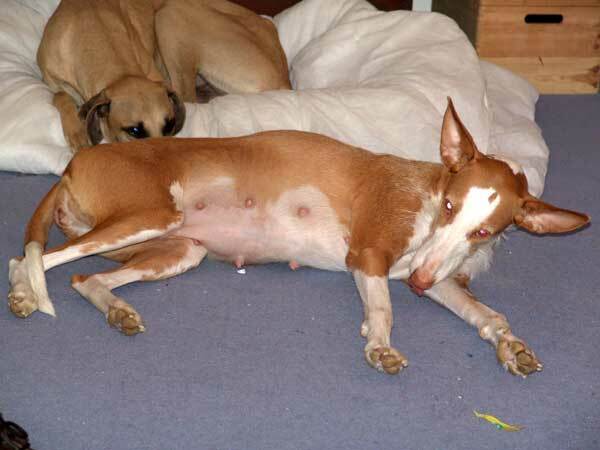 7th October 12:15am After four hours or so of episodes of panting and restessness interspersed with periods of relative calm, we had started to wonder whether a caesarean was going to be needed. then without warning, jas stood up from where she had been laid on the sofa, hopped down to the ground, and the first puppy plopped out unceremoniously onto the vetbed that we had put down for Jas to lie on. She seemed pretty surprised by that, as were we. she ran off, and we had to remove the membranes, and cut the cord. First puppy born! 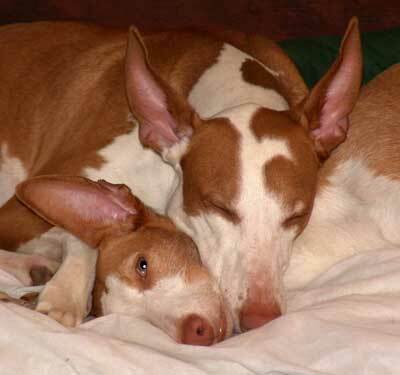 Her maternal instinct, after a slight delay, has asserted itself, and she is mothering the pups properly now. 6th October 3pm: We're getting close now. Jasmine has been nesting for the last 24 hours, and has been restless all morning. She is carrying toys into her bed and panting. Titan is almost as restless, and can't understand why Jas is not wanting to play with him. We didn't put a scan picture on the site last week, as there was so much movement in there I couldn't get a sharp picture. 28th Sept: Getting large now, birth is likely to be not too far in the future. We'll be doing another scan on Thursday unless it is rendered unnecessary! Titan has become quite solicitous, as if he knows something is going to happen. he stays around her a lot now. We're not sure if Jasmine appreciates this though. Fourth scan: Scanned on the 21st of september. 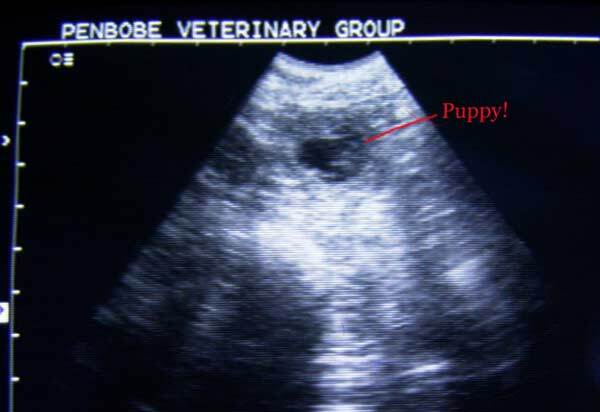 the view is an oblique cross section through the pup's chest. 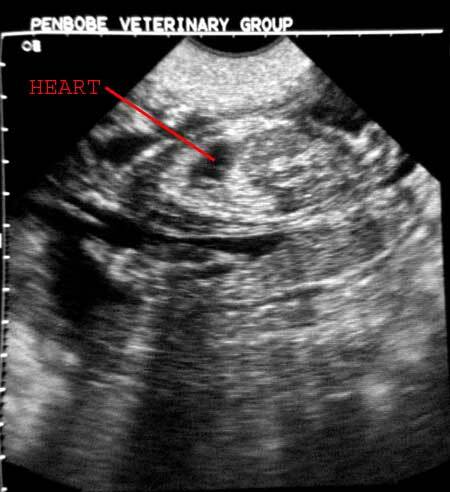 The heart of the pup is visible, and was beating away like a good 'un. Most of the fluid around the pups has now been absorbed again. Movement of the pups is now visible from the outside.